Investors will have opportunities to encounter offline DAYBIT, the third-generation cryptocurrency exchange the blockchain company builder Chain Partners will begin operating on Oct. 10. DAYBIT will have time to introduce the crypto exchange’s diverse features and services during the ABF in Seoul 2018 to be co-hosted by the Seoul Metropolitan Government, the Seoul Economic Daily and Chain Partners. 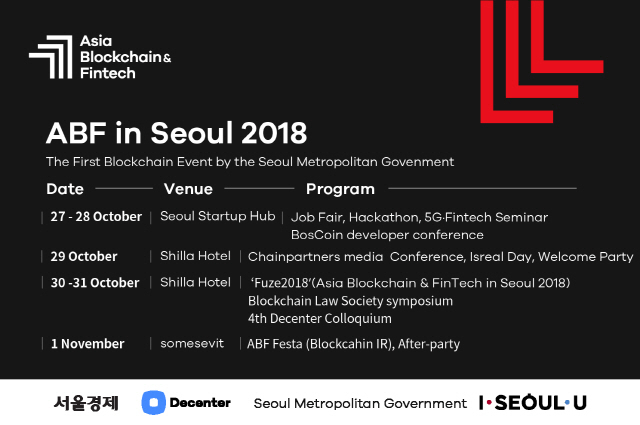 DAYBIT is now preparing a variety of events in job fairs, hackathons, 5G and fintech seminars, conferences and investor relations meetings to be held in the Seoul Startup Hub in Mapo, Shilla Hotel, Sebitseom and other places in Seoul. 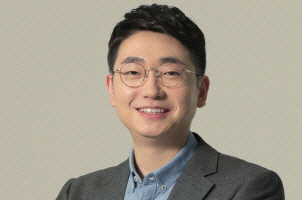 In a recent interview with cryptocurrency youtuber KillaWhale, Chain Partners CEO Pyo Chul-min expressed hope that “DAYBIT will set an example for other exchanges in operation, technology and security,” saying it will be a next-generation trading platform where transactions are handled fastest and security is excellent. 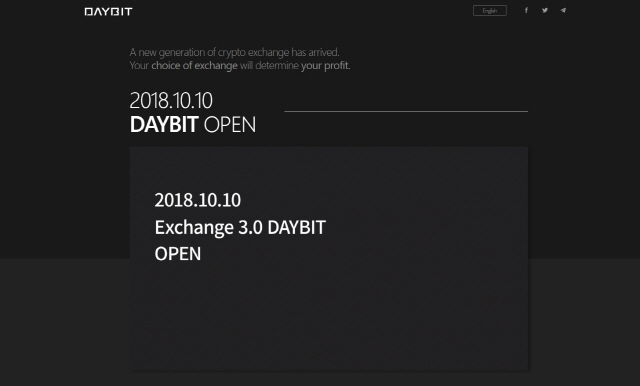 DAYBIT’s core competitiveness, underlined by Pyo, lies in reward program, automatic 24/7 ordering system, stable service enabling the handling of more than 100 million concurrent users, immediate airdrops using a self-developed cryptocurrency wallet and enhanced transparency enabling the disclosure of all transactions. DAYBIT, in particular, declared the decentralization of profits. It adopted the reward program to share transaction fees with investors, which will result in maximizing investors’ profits. Users receive DAY, the platform’s exchange token, in proportion to the trading volume and Bitcoin based on their contribution to DAYBIT. If users pay transaction fees with DAY, fees are to be halved. The more users’ DAY tokens and trading volumes are, the greater influence they can exercise on voting. DAYBIT plans to issue up to 200 million tokens. In the interview with KillaWhale, Pyo said, “Many exchanges including Fcoin have been beset with problems, including the suspension of mining programs, over the last six months although they have claimed to be mining-type platforms. We benchmarked these exchanges’ ups and downs and strived to create a sustainable exchange token model.” He seems to believe that DAYBIT will be able to offer more stable services than other exchanges. DAYBIT takes pride in adopting Elixir to cut transaction errors dramatically and ensure a stable trading environment. “Erlang,” created by Swedish telecom company Erickson as the basis for Elixir, is a concurrent and functional programming language that has been in use over the last 30 years. It makes it possible to establish stable systems by handling large amounts of web sockets and has been used in such services as Naver’s LINE, WhatsApp and League of Legends that must handle millions of concurrent users. “Compared with existing Java-based exchanges, DAYBIT, armed with the Elixir engine, can handle transactions up to 17 times faster on average,” Pyo said, pledging to prevent investors from suffering losses resulting from the problems of exchanges such as exchange stoppage owing to massive transactions and server troubles. Chain Partners chief technology officer Lee Je-chol said in a telephone interview, “One of the most important things technically in developing exchanges is to ensure smooth cryptocurrency deposits and withdrawals and handle massive web sockets. Very few of existing exchanges are able to address these problems.” That is, DAYBIT developed its system in person to ensure the stable operation of the exchange. The crypto exchange has taken diverse measures to enhance usability. A “conditional order function,” which is adopted by securities companies, is embedded in consideration of the crypto exchange’s trait: transactions should continue around the clock without stop. This function allows investors to place orders in advance so that transactions are done automatically within the desired range, taking into account the characteristic of cryptocurrency - severe price fluctuations. For example, if an investor places a trailing stop order at a certain point, say 10%, in case the Bitcoin price is falling after hitting a high of 8 million won, he or she doesn’t sustain a loss further. Investors don’t need to watch prices around the clock thanks to diverse support functions for trading. In addition, there are other functions that make investors feel convenient and comfortable. Trades will be disclosed transparently to ensure the public’s confidence in crypto exchanges. DAYBIT says it will transparently disclose investors’ transactions with cryptocurrency developers and exchanges. It also decided to abolish listing fees to allow only “healthy projects” to be introduced into investors. In addition, DAYBIT hinted at convenient user interface and user experience; support for air drops through its own wallet; and decentralized applications (DApps).